As you will learn in an upcoming post, we took off in our new RV for a while to escape the transition from Winter to Spring. It seems that Mother Winter simply does not want to loosen her icy grip on the weather this year, and although we've had lots of signs of Spring (the aspens are leafing out, a few wildflowers, game on the roam getting ready to give birth to this year's babies, longer days and warmth in the sun), we still get hit with cold nights, snow showers and cloudy days. Glad we had not taken the tracks off yet. Soon after getting back from a trip "down South", the crew that is refubishing the exterior of the cabin showed up. They were able to get the entire outside sand-blasted and hand-sanded, and were ready to start the staining process. But, for a week we'd heard a consistent weather forecast: a "significant" snow event on Thursday and Friday. 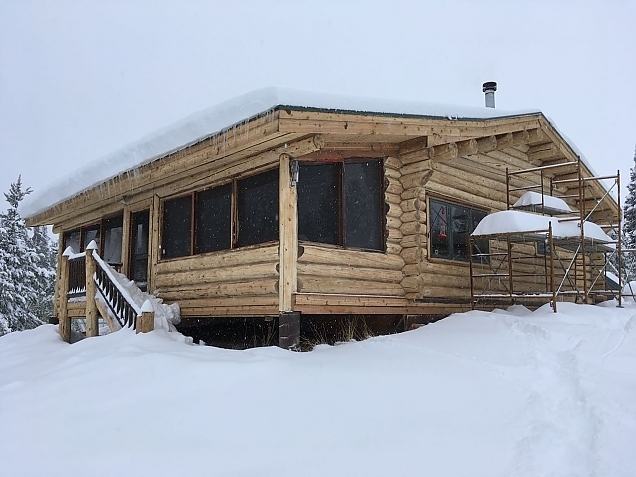 With as much as 30" of snow predicted, that crew bailed out and went home on Wednesday with a plan to return next week. 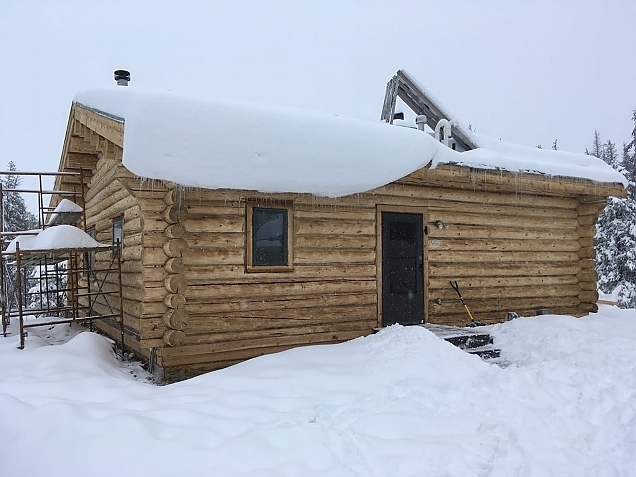 Cabin is ready for stain! Sure enough, the forecasters were right (this time) and it started snowing on Wednesday evening. It continued all day Thursday, and while we got huge accumulations, it was not the kind of snow we expected. We were expecting large lazy flakes coming down on a dark and dreary day accumulating wet, heavy snow. Instead, the layer of clouds was thin. It was relatively bright--so much so that we got some battery charging via the solar panels (which I kept clearing off). And, the flakes were small, but very dense. 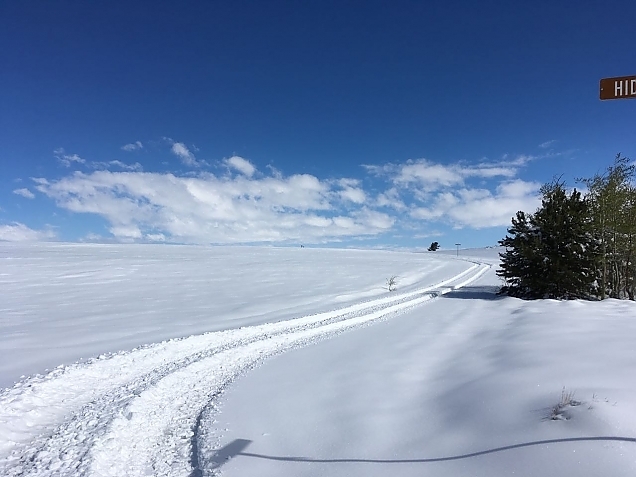 We probably got 15" to 16" in Thursday, but it also started melting quickly. 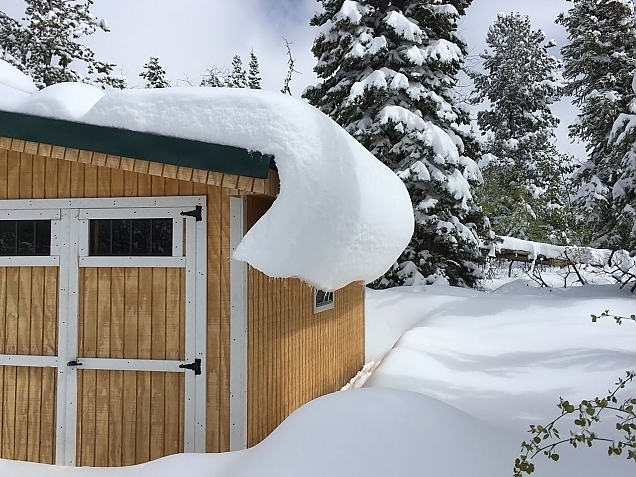 On Friday, we got about 20" or so. It did not melt as fast. Altogether, I think we got about 3' of snow, with about 2' of that remaining on the ground when the storm passed. 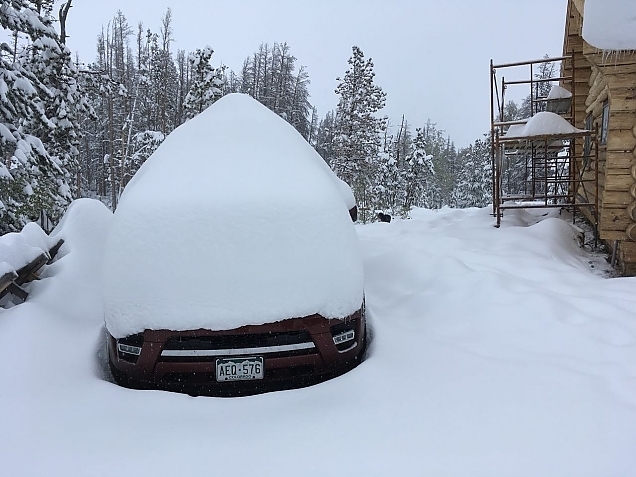 Both trucks are at the cabin, so "snowed in". 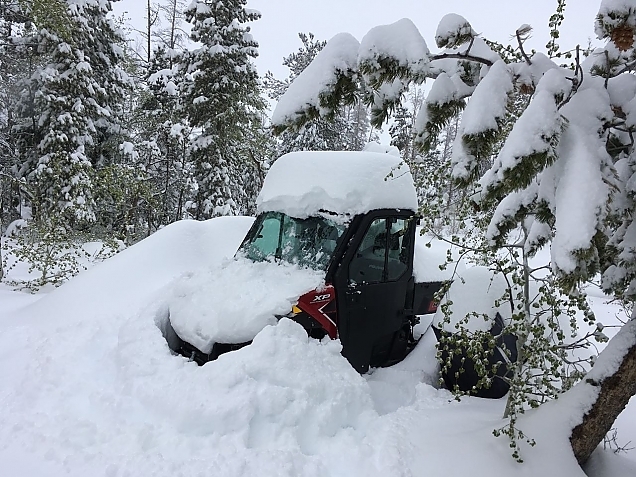 But, we still have tracks on the ranger. We even drove it over to check in with our neighbors, but it was very, very difficult to find the road. Everything was covered with a blanket of snow and we could not see the sage bushes or make out the path of the road. And, it was so blindingly white that we could not see for a few minutes after coming inside. 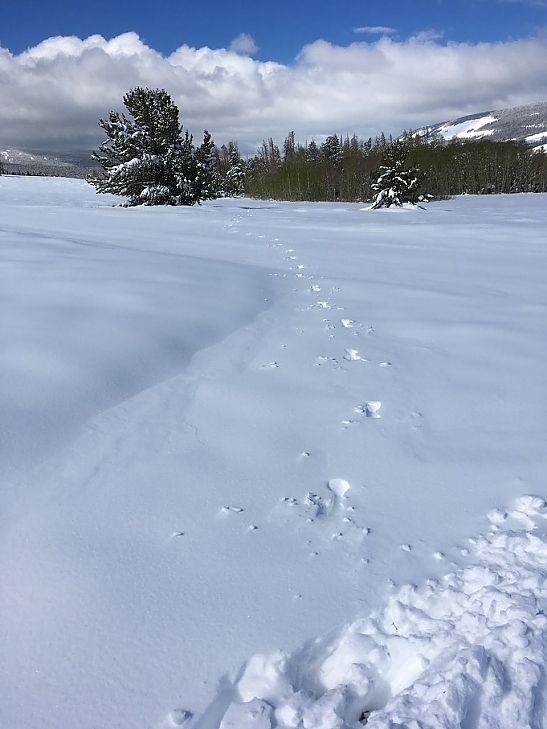 At least the snow makes it easier to see where animals have been walking. 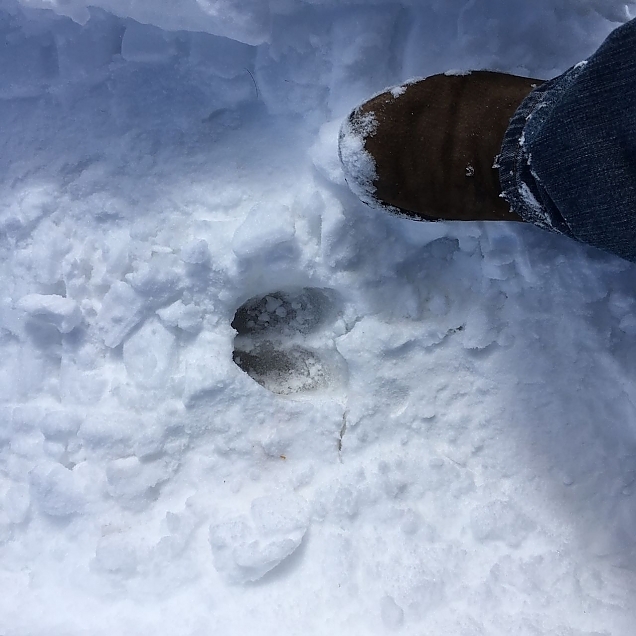 Here is the track of a large moose. And, here is where he came from. Today, Sunday, we are looking at possible rain showers. It melted a lot yesterday when we had bright sun and some wind. 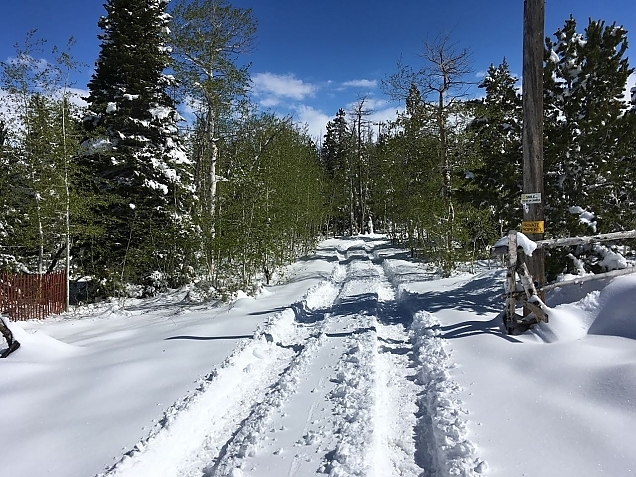 I plowed Wapiti Way to the county road, and it appears that there is much less snow at lower elevations and that if we wanted, we could drive out. It was pretty tough trying to find the road. The crew will be back on Tuesday and we have a lot of work to do before we start to get Summer visitors in early June.